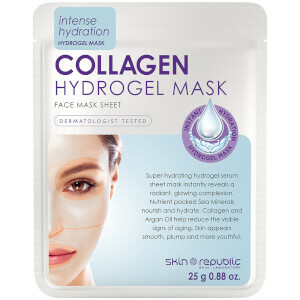 Transform your skin with the Skin Republic Collagen Hydrogel Face Sheet Mask, a nourishing sheet mask infused with an anti-ageing serum for a plumping and smoothing effect. 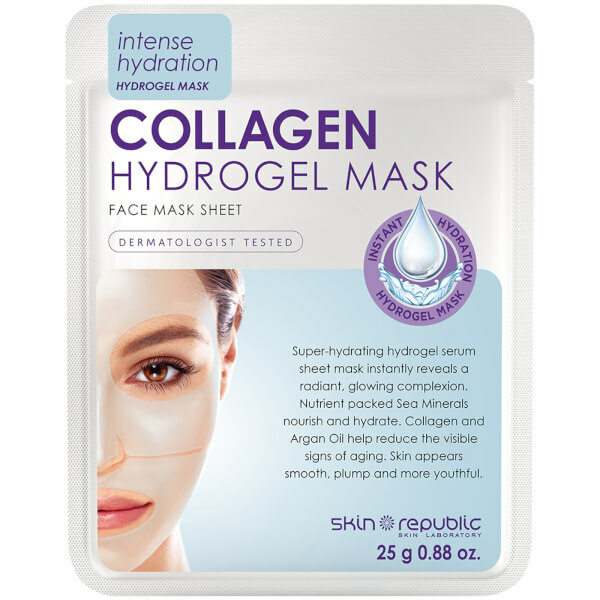 Utilising next generation hydrogel mask technology for close and continuous contact, the essence-infused face mask adheres comfortably like a second skin, allowing optimum absorption of ingredients for maximum efficacy. Helping to restore moisture, elasticity and a youthful glow, the sheet mask combines a cocktail of nutrient-packed Sea Minerals with Argan Oil and Collagen to nourish and hydrate while visibly minimising signs of ageing. Delivering instant hydration, the comfortable mask will leave skin feeling smoother, plumper and radiant.